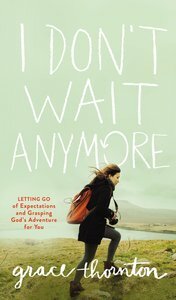 In I Don't Wait Anymore, Grace Thornton challenges readers to find their calling and purpose from God and go after it with completely committed hearts-even if life isn't at all what they expected. Grace's writing focuses on defining herself as a child of God, not just by her marital status (or lack thereof). She grew up expecting to go to college, get married, have babies, and live out her life in one place, but that's not what God ended up calling her to. She still longs for a husband and children, but she has come to understand that God's plan is different for each of us and doesn't always take into account what we want, but rather what He needs for us. So she doesn't wait anymore or make plans based on her desires. Instead, she listens to God and follows His plan. Grace is a single woman in her early 30s with no children, and her professional career has taken her to strange and amazing places to spread God's Word and has opened her eyes to all she would have missed if she kept waiting. Many books on singleness focus on remaining pure and resisting temptation while waiting for your spouse. Grace takes that as a given and, instead, focuses on living for God joyfully regardless of whether or not she ever finds a spouse. This positive and encouraging gift book offers inspiration to young women and men who want to live a fulfilling life physically, emotionally, and spiritually, regardless of whether or not marriage or kids is in God's plan for them. Beyond simply dealing with singleness, Grace deals with identity, desperation, loneliness, frustration, and finding hope in darkness. About "I Don't Wait Anymore"
Customer Reviews For "I Don't Wait Anymore"
Grace writes with pure, engaging honesty about her journey to REALLY knowing and trusting God. A beautiful book with a truly powerful and life changing message!